24th March 1918, aged 39. Son of the late Maj. Charles Edward Bovill (Royal Inniskilling Fus.) and Ellen Marie Bovill; husband of Ethel Rachel Bovill, of 32, Clapham Rd., Bedford. James Barker Bradford, M. C.
14th May 1917, aged 27. Son of Mrs. Bradford, of Milbanke, Ravenlea Rd., Folkestone, and the late George Bradford; husband of Annie Bradford. Frederick John Cheek, M. M.
Son of W. Cheek, of 44, Hertford Rd., East Finchley. 28th March 1919, aged 23. Husband of Olivia M. Dearnaley, of 35, Parkinson St., Burnley. Son of Mrs. C. Duddy, of 80, Kirklow St., Carluke, Lanarkshire. 6th June 1917, aged 36. Son of John and Jane Elizabeth Edwards, of Carnarvon; husband of Martha Ann Edwards, of 83, Iona St., Leith, Edinburgh. 25th November 1917, aged 31. Son of James and Maud Harvey, of Adelaide, South Australia; husband of Elspeth M. Dudgeon (formerly Harvey). (Above right) - Studio portrait of Captain (Capt) Gilbert Aberdein Harvey and Elspeth Young on their wedding day. A doctor from Adelaide, SA, he enlisted with British Forces in 1917 and served with the Royal Army Medical Corps attached to 1st Battalion King's Own (Royal Lancaster) Regiment. 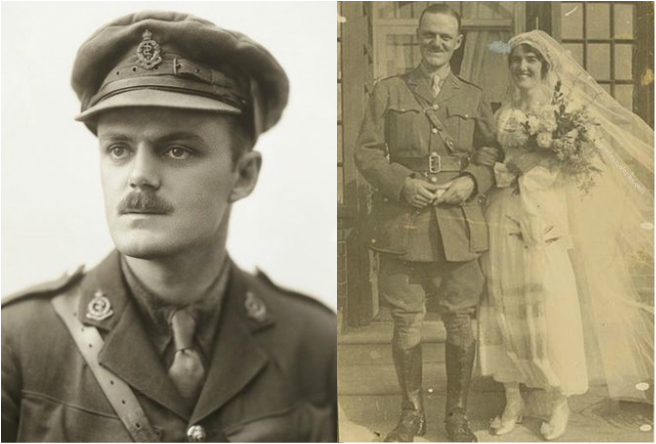 On 29 September 1917, whilst on leave in Cornwall, he married Elspeth Young. On 25 November 1917, less than two months after his marriage, Capt Harvey was killed in action in France. 9th February 1918, aged 41. Son of Johannes and Nicoline Johannessen, of Thorshavn, Faroe Isles; husband of J. J. Johannessen, of 57, Iona St., Leith, Edinburgh. 28th September 1918, aged 20. Son of Charles & Jessie Key and younger brother of Jessie Ann Key of Perdue, Saskatchewan, Canada and formerly of Portskewett, Monmouthshire, Wales.